Wildflowers and scenic vistas abound on the hike to Ellis Peak. 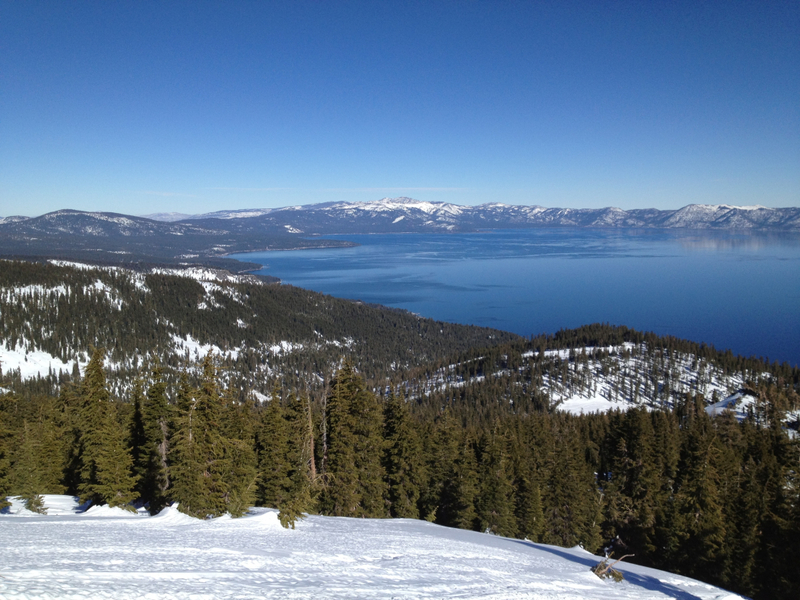 The stunning cobalt waters of Lake Tahoe from Ellis Peak during a Winter hike. This is a 6.0 mile roundtrip hike. Although this is a short hike, it has sections of steep, grueling climbs. This is best done when wildflowers are blooming just after Spring snowmelt. Ellis Peak is a hidden gem amongst all of the big-name peaks in Tahoe. Yet, what 8,740 foot Ellis Peak lacks in name recognition, it makes up for in big views of Lake Tahoe, Desolation Wilderness and the Sierra Nevadas. 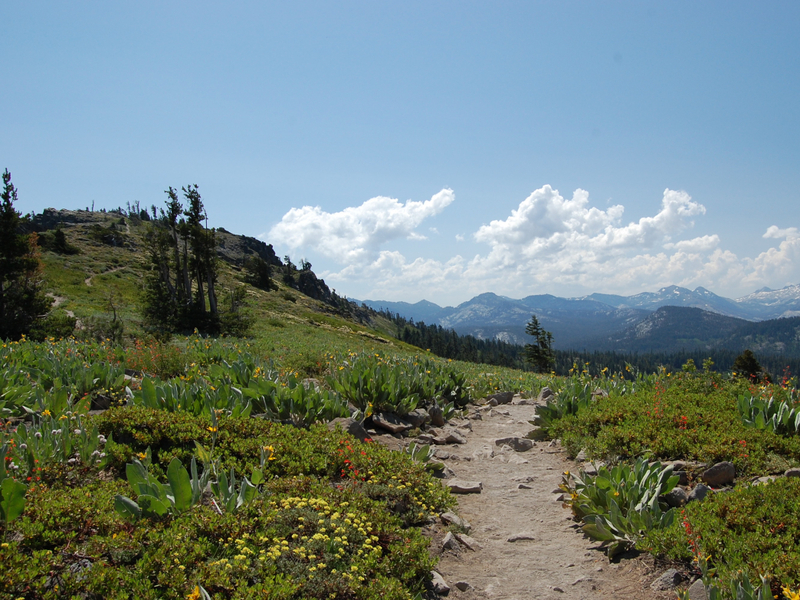 Intermediate day hikers can reward themselves with these incredible vistas by way of an approximately 6 mile roundtrip hike from Barker Pass Road just South of Tahoe City. Wildflower enthusiasts and amateur photographers will have a field day on this Ellis Peak summit adventure with golden fields of blooming mule’s ear in stark contrast with the deep green of the surrounding forest. Beginning from the Ellis Peak trailhead on Barker Pass Road, the trail begins with a somewhat discouraging uphill slog up a forested volcanic ridgeline, gaining approximately 700 feet of elevation in the first mile. Almost as soon as you have conquered the elevation gain from the first mile, you find yourself immediately descending approximately 400 feet to a low saddle separating your current ridgeline from the one connected with Ellis Peak. From this saddle in the mountain, the trail climbs an additional 600 feet to the summit of Ellis Peak. On the way to the summit, the trail crosses a junction with a dirt road used by Off-Highway Vehicles, with the option to hang a left to Ellis Lake. If given enough time, Ellis Lake can be a worthy side trip, but the summit should be given top priority. Continue for an additional half mile past the OHV junction as you make the final push for the summit of Ellis Peak. Head-spinning views abound from the summit as Lake Tahoe, Desolation Wilderness, and the sprawling Sierra Nevadas all captivate your senses. The craggy summit offers plenty of seating areas to rest, snack, and bask in the fruits of your labor before reversing your trip back to the car. The hike to the summit of Ellis Peak is a perfect trip for intermediate hikers new to the Tahoe area and long-time locals looking to remind themselves why they live here This moderate hike offers similar panoramic views of Tahoe as many of the other big-name peaks of the region with significantly less steep sections to overcome. Timed right, this hike can also bring out the wildflower enthusiasts who don’t mind lugging their cameras up a few hills to capture fields of blooming Mule’s Ear, Lupine, and Paintbrush. Be aware that mountain bikers do occasionally use this trail and respect among all users is always the best route. Parking is usually abundant and there are no fees or permits required for this breathtaking hike. 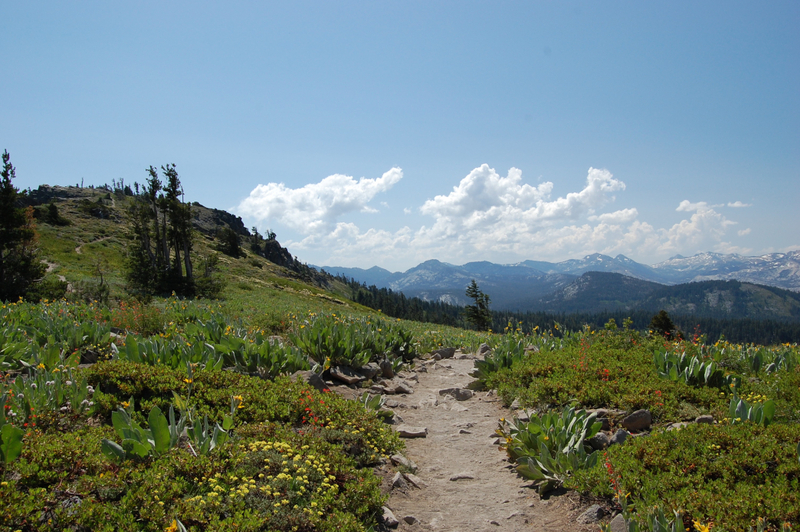 To access the trailhead from South Lake Tahoe, take Highway 89 North toward Tahoe City for approximately 23 miles. Observing signs for Kaspian Point Campground and Blackwood Canyon, turn left on Barker Pass Road. Continue on Barker Pass Road for an additional 7.0 miles before reaching the Ellis Peak trailhead on your left. If you reach the Tahoe Rim Trail trailhead, you have gone too far.